What do you do if you are one of the Royal Navy’s smallest vessels and you find yourself running low on fuel, without a Royal Fleet Auxiliary to hand? Answer: You find the nearest capital ship instead. Sea Khanjar, a joint amphibious exercise with the United Arab Emirates, proved the ideal opportunity to test the theory in practice. Fleet Flagship HMS Albion demonstrated yet another element to her array of capabilities by transferring a tank load of fuel to the mine counter measures vessel (MCMV) HMS Middleton. The event required the 750 tonne mine hunter to moor alongside the 18,500 tonne amphibious assault ship. This required expert seamanship and steady nerves from both Bridge teams. 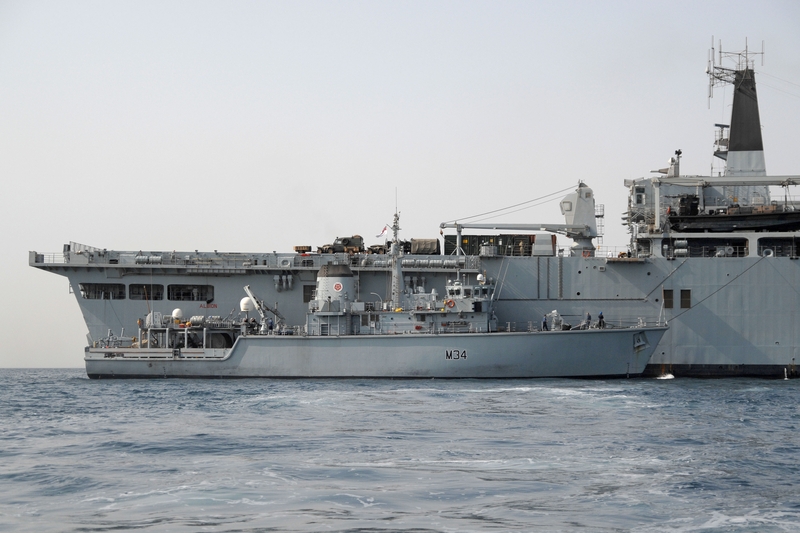 HMS Middleton, together with fellow Bahrain based mine hunter HMS Pembroke, had joined forces with the Royal Navy’s Response Force Task Group off the coast of the UAE for exercise Sea Khanjar. Their principle task during the exercise was to demonstrate the important contribution of mine hunters to operations in the ‘littoral’ – the shallow waters in the vicinity of a coastline – by sailing ahead of a simulated amphibious assault to ensure the route was clear of mines. HMS Albion’s fuel efficient engines mean she can sail from the UK to the Falklands Islands on one tank of fuel, so topping up an MCMV was no trouble. On completion of the exercise and the refuelling, all three ships departed to continue with their own separate tasking. Lt Cdr Andy Ingham, Commanding Officer, HMS Middleton, said: “Sea Khanjar was a valuable experience and provided excellent training for Middleton and her team. It gave us the chance to not only contribute to an important bilateral exercise but also to prove MCM integration into an amphibious operation.